Leaves your face looking years younger. It enhances cell regeneration, improving skin metabolism. A rare combination of Herbs traditionally used to give radiant glow to the skin. Established in 1997, NCL Agro foods (vedantika Herbals) is a group of researchers and scientists headed by Shri N. C. Limbasiya. Shri N. C. Limbasiya, a food technologist and a well known name in Gujarat, is also an advisory board member of medicinal plant and preservation board of Saurashtra university. He is doing research in natural foods, food preservation, food based supplements, herbs and its effects on the human body for the last 16 years. He has successfully developed 65 innovative products in this period. The outcome of his research is substantially devoid of all possible chemical preservatives and synthetic colours.Established in 1997, NCL Agro foods (vedantika Herbals) is a group of researchers and scientists headed by Shri N. C. Limbasiya. Shri N. C. Limbasiya, a food technologist and a well known name in Gujarat, is also an advisory board member of medicinal plant and preservation board of Saurashtra university. He is doing research in natural foods, food preservation, food based supplements, herbs and its effects on the human body for the last 16 years. He has successfully developed 65 innovative products in this period. The outcome of his research is substantially devoid of all possible chemical preservatives and synthetic colours. Vedantika Herbals Instant Glow Mask brings all the goodness of Nature in one pack. The mask is good for all types of skin. It makes the skin brighter and fairer within minutes. Multani mitti (fuller’s earth) deeply cleanses clogged pores and purifies the skin. Tulsi with its anti-inflammatory, antibacterial and antiseptic properties keeps the skin germ, bacteria and infection free and prevents acne and pimple reoccurrence. Sandalwood relaxes and soothes tired and dull skin. It slows down the ageing process. Nutmeg fades out acne/pimples marks leaving the skin clear and fresh. The glow mask locks the moisture of the skin cells and deeply hydrates and nourishes the skin. It reinvigorates and rejuvenates the skin. The face mask instantly makes the skin smooth, firm and youthful. 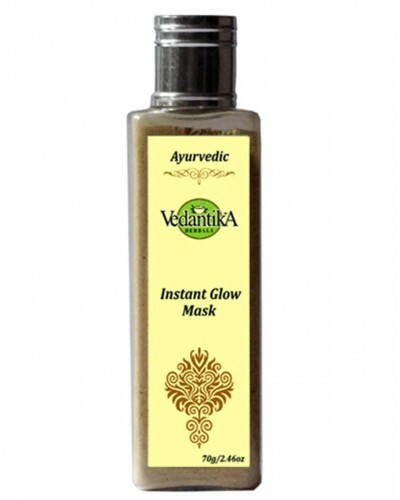 For a radiantly glowing skin treat yourself with Vedantika Herbals Instant Glow Mask.